KUALA LUMPUR • One person was killed and 13 others, mainly Singaporeans, were injured when their bus rammed into another vehicle near Kuala Lumpur, Malaysia, yesterday. A spokesman for the Selangor Fire and Rescue Department said it received a distress call at about 3.30pm concerning an accident involving a bus and a lorry on the Karak-Kuala Lumpur Expressway, Bernama news agency reported. The accident involved 11 Singaporeans - aged between 19 and 81 - and three Malaysians, including the driver and the bus conductor. Most of the Singaporeans, including an 81-year-old woman, suffered light injuries, Malaysian police said. The lorry driver was also hurt. All the injured were taken to Selayang Hospital in the Gombak district of Selangor state for treatment, the spokesman said. Pictures of the accident circulating online showed that the coach involved in the crash belonged to local firm Transtar Travel. When The Straits Times visited Transtar's head office at Golden Mile Complex on Sunday (April 8), a staff member said that investigations are ongoing and coach operations are operating as normal. He declined to comment further. A spokesman for Singapore's Ministry of Foreign Affairs said on Sunday that officers from the Singapore High Commission in Kuala Lumpur have visited the injured Singaporeans at the Kuala Lumpur General Hospital and Selayang Hospital. "The High Commission and the Ministry of Foreign Affairs will continue to assist the affected Singaporeans and their next-of-kin," the spokesman said. Singaporean Yip Keng Yim, 19, one of the bus passengers, told Bernama news agency: "It happened so fast and everybody was thrown off their seats." She was with her parents, a cousin and an aunt. They were on their way home from Genting Highlands. "After boarding the bus, I was not able to sleep because it was being driven at high speed. 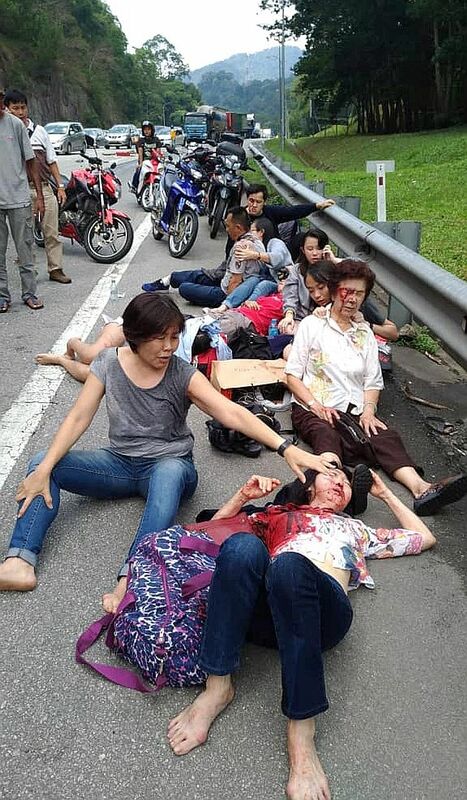 Suddenly, I heard a loud crash, and then everybody fell off their seats," said Ms Yip at Selayang Hospital. Ms Yip, who suffered injuries to her face, said her father sustained a serious leg injury. Photographer Kong Chong Yew said he was driving to Genting Highlands when he saw a massive jam on the other side of the highway where the accident had occurred. The windscreen was already gone, and the left side of the bus was badly damaged. PHOTOGRAPHER KONG CHONG YEW, on the devastation he noticed. He had been driving on the other side of the highway where the accident occurred. The front of the bus had slammed into the back of the lorry, said the 32-year-old, adding that there were many people gathered around the accident spot when he drove past. "The windscreen was already gone, and the left side of the bus was badly damaged." It is believed that the bus driver lost control of the vehicle, which then rammed into a gravel lorry, trapping the conductor near the front of the mangled bus, China Press reported, citing Gombak district police. The conductor, identified as Mr Carles Lagan, 26, died on the spot. When contacted by The Sunday Times, Selayang Hospital staff said they could not provide updates on the status of the injured. On Friday, 23 people, including 16 Chinese tourists, were injured when their bus crashed near Genting Highlands. Last month, one Singaporean was killed and several others were injured in a bus accident in Mecca, Saudi Arabia, when they were carrying out their minor pilgrimage.